“It’s all in the family,” writes CAROL STEWART GOERZ ’77. Last May, she happily welcomed new grandson Mason Sizer as the latest addition to an extended clan laced with Seattle Pacific University Falcons that include Mason’s dad, MATT SIZER ’05; mom, ELISE GOERZ SIZER ’07; aunt, STACI GOERZ CROUCH ’04, and her late husband, JORDAN CROUCH ’04. Mason also claims grandparents EARL SIZER ’76 and SHARON JOHNSON SIZER ’78, great-grandfather ROLAND STEWART ’51, and (deceased) great-grandmother HELENE BROWNLEE GOERZ ’45. And reaching way back when, Mason is the great-great-great nephew of the late WILBUR MCCORMICK ’30. ROSE GAIN BROWN ’71 has retired after 29 years of teaching, 18 of them in Oregon’s Dufur School District. She taught kindergarten, and high school art and home economics. Rose and her husband celebrated her retirement by taking a trans-Atlantic cruise, which began in London, England, went as far north as Iceland, and then embarked on a five-day journey across the Atlantic Ocean. Rose lives in The Dalles, Oregon. Medallion winner Jim Lyon ’74 describes himself as being “tethered” to God, more dependent on him than ever, as he ramps up his new job as general director of Church of God Ministries in Anderson, Indiana. Tasked to bring sweeping changes to the Church of God denomination, which has more than 2,100 congregations in the U.S. and Canada, Jim is in a position to speak into the lives of a million people worldwide. “My days are very substantive, having the potential for great outcomes,” says Jim. Prior to assuming his present position in August 2013, Jim served for three decades as a senior pastor for two congregations. He is a speaker and host for “ViewPoint,” a radio broadcast of the Church of God, and author of Go Ahead. Ask Anything. In the early 1980s, Jim was a member of the Washington State House of Representatives. DANA GREEN ’80 is a senior partner at the human capital consulting firm Morgan Samuels. He leads the firm’s consulting practice. Dana has more than 34 years of business experience, including as founder of D.A. Green & Associates, a consulting firm to Fortune 1000 executives, and as co-founder, with John P. Kotter, of Kotter International’s predecessor company, specializing in enterprise-wide change efforts often involving complex, large-scale global environments. Earlier in his career, Dana was a senior manager with Boeing and a corporate development director with Microsoft, where he led key aspects of more than 40 domestic and international acquisitions and helped launch Expedia, MSN, and MSNBC. His office is located in Los Angeles. 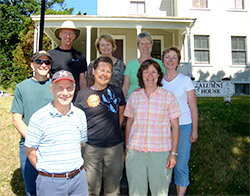 VICKI MALINOWSKI TINKER ’80 of Soldotna, Alaska, reports that the 35th reunion of SPU’s last Casey Quarter students gathered in June 2013 at Casey Conference Center. They stayed in what is now Alumni House, the same former officers’ quarters they lived in back in 1978. Returnees included KIM HALLMEYER ANDREWS ’81 of Juneau, Alaska; JOY DROVDAHL ’71, MED ’84 and ROBERT “BOB” DROVDAHL ’71, who was Casey program director when the final Casey Quarter was held; DON MARTINELL ’81 and SUZANNE “SUE” GILBERT MARTINELL ’81 of Sultan, Washington; MIA HOLFSTAD REDDEN ’82 of Brier, Washington; LORI LARSON SYTSMA ’81 of Oregon City, Oregon; and PAUL TAYLOR ’81 of Shelton, Washington. This was the first of their reunions to actually be held at the Casey campus. “The years just erased!” says Sue. “We still all get along very well.” For four years, Casey Quarter provided an opportunity for students to live and study in a small, off-campus community. SPU professors traveled to Casey weekly to teach 5-credit classes. Sue says their studies included “Ergs and Genes” (science), “Creation” (art), and “Christian Faith and Values” (taught by Bob). Medallion Award winners Bob Ekblad ’82 and Gracie Johnson Ekblad ’82 recruit and train people “to be about ministry and mission.” Founders and directors of Tierra Nueva (or “New Earth”), the Ekblads work with a team of staff and volunteers to serve those on the margins of society, including inmates, the homeless, those struggling with addiction, and immigrants working as farm laborers in Skagit County, Washington. The couple founded Tierra Nueva in Honduras in 1982 as a sustainable farming and preventive health program, combined with grass-roots Bible study. Then, in 1994, they established Tierra Nueva in Burlington, Washington. The two branches of Tierra Nueva remain connected through a coffee-growing and roasting project. At their retreat center located on 35 acres along the Skagit River in Washington, the Ekblads start their day with a walk around the perimeter of their land before teaching, ministering, training, and studying. The Ekblads enjoy cross-cultural ministry and have taught in Sweden, Thailand, and Mozambique, to name a few places. The Ekblads recently traveled to Paris for a year with their three children (22, 21, and 18) to teach and preach. In the midst of their service to help those who are often neglected, there have been some surprises. Gracie says she and Bob have experienced warm hospitality from people living on the margins of society. ADONNA DEIBEL ’85 is co-owner of Old Barn Rescue Company, purveyors of professionally designed and hand-lettered vinyl wall decals and stickers, home décor, signs, and gifts for interior decorating. A former artist for American Greetings, Adonna created a calligraphy font named after her son, Blake. She and her business partner, Jan, started the venture when Jan’s dad tore down the barn from her childhood farm. Adonna urged Jan to save the weathered wood, and the two women’s vintage creations and “green” home décor soon followed. Adonna works from home in Spokane, Washington. CHARLES FARHADIAN ’86 is professor of world religions and Christian mission at Westmont College. In November 2013, he spoke about “World Religions in Community” for Westmont Downtown: Conversations About Things That Matter, sponsored by the Westmont Foundation. At Westmont since 2004, he holds a master’s degree in divinity from Yale University, and a doctoral degree from Boston University. In 2011, he was named Westmont Faculty Researcher of the Year and in 2012, Westmont’s Teacher of the Year. His newest book is The Oxford Handbook of Religious Conversion, co-edited with Lewis Rambo. He lives in Santa Barbara, California. DAVID BIRELINE ’87 is athletics director at Concordia University Irvine. In last fall’s NAIA national soccer tournament, his men’s soccer team defeated Corban University, whose athletics director is GREG EIDE ’77. Greg’s men’s soccer team had defeated Concordia University Portland men’s soccer team to earn the matchup with CU–Irvine. The athletics director at CU–Portland? None other than MATT ENGLISH ’00, whose teams are set to join SPU in the NCAA’s Great Northwest Athletic Conference next fall. Though none of the three collegiate ADs were able to bring home a national trophy, all remain Falcons in good standing. Mike Quinn ’85, politician, volunteer, Microsoft executive, father of four girls — and beekeeper — is a 2014 Medallion Award winner. Mike has worked at Microsoft Corporation in Redmond, Washington, for two decades. In a typical year, he logs more than 100,000 air miles, working with companies around the world that build and sell Windows devices with Microsoft. With so many gifts as a business manager, he’s not surprised this sometimes spills into his personal life. “My family describes me as management,” says Mike. “That’s a joke in our house! I have a to-do list, and I try to keep us organized.” But, he says, the one who really runs things is Kris, his wife of 28 years. During precious downtime, his family is at the top of his list. He is a devoted letter-writer to his four daughters, ages 17–24, prays for them, and regularly connects through Skype when the miles come between them. Between work, family, and beekeeping for up to 10 hives, Mike is in his second term on the town council in Woodway, Washington. He says he was drawn to the job because it is a way to serve his small town. He also recently was elected to Seattle Pacific University’s Board of Trustees. SUZANNE EMERY ’91, MSN ’99, has been a missionary with the Latin America Mission, a ministry of United World Mission, in San Jose, Costa Rica, for more than 16 years. She works with “Created to Be Free: Hope for Children Affected by Alcohol.” Suzanne educates others about the risks alcohol poses to unborn and nursing children and is passionate about an effective neurobehavioral model that shows promise in treating brain-based disorders. When stateside, she resides in Lake Oswego, Oregon. MAGGIE PETERSON ’97 is a member of the Edmonds Center for the Arts board in Edmonds, Washington. After a career in sales and marketing with The Sheraton Corporation, she decided to follow her dream of being a teacher. At the age of 31, she took her first college class and four years later graduated from SPU with a degree in social science education. She taught at the Edmonds Homeschool Resource Center for 15 years. Now retired and a member of the ECA board, she is also marketing director for My Neighborhood News Network and helped in the capital campaign that made the Edmonds Center for the Arts a reality. Maggie and her husband, Rocky, live in Edmonds. Michele graduated with a bachelor of science in physics and engineering science with honors from Seattle Pacific University and a master’s degree in optics from the University of Rochester. She’s been a change agent as a chief engineer in industry and as a senior executive in the government, serving at the National Geospatial-Intelligence Agency, National Reconnaissance Office, and the Office of the Director of National Intelligence. Michele and her husband, Lt. Col. Christopher Quaid, served in the national security community together — traveling around the world, including in combat zones, in support of U.S. and Coalition operations. They seek to instill a sense of purpose in their daughter, Sophia, a kindergartener who loves exploring the world with them. ALEXANDER “ALEX” THOMASON ’00 was appointed as secretary to the Brewster Chamber of Commerce in Eastern Washington. A local attorney, he is founder of Thomason Law and Justice with offices in Brewster and Seattle. Alex was a contestant on the third season of TV’s popular reality show The Apprentice and ultimately fired by Donald Trump. A former attorney for the King County Prosecuting Attorney’s Office, he lives in Brewster, Washington, with his wife and three kids. JEANETTE DEBLOIS FIESS ’02 traveled in November to Washington, D.C., to receive a GreenGov Presidential Award and the honor of being named a Sustainability Hero. During her tenure as manager of the energy and sustainability program for the U.S. Army Corps of Engineers, Northwestern Division, Jeanette increased the number of personnel in her division trained in Leadership in Energy and Environmental Design (LEED) by 70 percent. Among her other achievements, the electrical engineer developed a training class on energy efficiency, water reduction, and waste minimization. Jeanette is married to MATTHEW FIESS ’02, a flight test engineer for Boeing. The couple lives in Seattle with their son, Cameron. JENNIFER KOWALSKI ’07 was chosen as one of the 2014 “30 Under 30” award winners by the National Kitchen & Bath Association. Jennifer is a designer with Seattle’s Best Plumbing, which has specialized in construction, remodels, and repairs for more than 40 years. An interior design major, she started her career with VILLA Fine Kitchen and Bath and worked on projects from the homes of Microsoft executives to the penthouse suites at Seattle’s Four Seasons Hotel. Along with the 29 other industry professionals so honored, Jennifer presented her design explorations at the 2014 Kitchen & Bath Industry Show in Las Vegas February 6. NANCY NORDENSON MFA ’07 and her essay, “Prelude,” were noted in Best American Essays 2013 (Houghton Mifflin Harcourt). “Prelude” originally appeared in the literary journal Lake Effect. This is her third notable mention in that essay series (also 2010 and 2012). She has also received two notable mentions in the Best Spiritual Writing series (2012 and 2013) and multiple Pushcart nominations. Nancy has been a medical writer for 16 years. She and her husband live in Minneapolis. TIMOTHY BARTEL MFA ’10 has contributed to a collection of essays titled Joss Whedon and Religion: Essays on an Angry Atheist’s Explorations of the Sacred (McFarland, 2013). Tim’s essay is “The Harrowing of Hell: Joss Whedon’s ‘Anne’ and the Greek Paschal Tradition in Conversation.” A poet and educator, Tim has been published in Christianity and Literature and his first book of poems is The Martyr, The Grizzly, The Gold (Damascene Press, 2012). He teaches literature at Houston Baptist University and lives with his family in Houston, Texas. ZACHARIAH “ZACH” BRYAN ’11 is editor of The Tundra Drums in Bethel, Alaska, on the Yukon Kuskokwim Delta. He serves as a news writer, photographer, and coordinator of news gathering for both the print and online versions of the newspaper. At SPU, Zach was assistant news editor of The Falcon and graduated with a degree in English with a creative writing focus. “I want to give a voice to the region, bringing the untold stories to the forefront,” he says. He also wouldn’t mind wetting a line in the fish-rich waters of Alaska. Zach lives in Bethel, Alaska. ELIZABETH MARSTON ’12 received the John Eargle Award for excellence in technology and music from the Educational Foundation of the Audio Engineering Society. The award’s namesake was an Oscar- and Grammy-winning audio engineer and musician whose work led to the development of modern cinematic sound quality. Elizabeth is studying for a master’s degree in music in sound recording from Canada’s McGill University. She lives in Montreal, Quebec. EMILY BROWN ’13 was a SPRINT coordinator and self-designed cultural anthropology major at SPU. Forever changed by a one-month SPRINT experience in Russia, she seeks a life of service and is currently on an 11-month classroom assignment in Zambia. Under the auspices of the Mennonite Central Committee, she teaches eighth and ninth grades at Macha Mission Basic School. Among the many things she has learned are that Zambians do not like to be alone, that arriving unannounced at someone’s home is not a social offense, and that a philosophy of “there’s always room for one more” prevails. Emily often asks herself, “What new facet of God’s character is God trying to reveal to me here?” Her hometown is Salem, Oregon.